Summertime is a great time to go camping with kids! If you do not have an opportunity to visit a real campground, creating an environment to explore camping activities (whether indoors or outside) can be fun for kids. 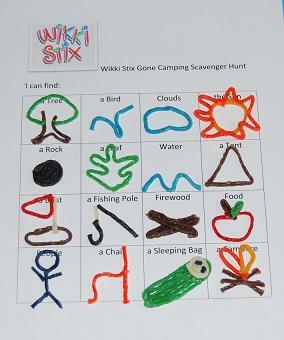 The Wikki Stix camping activities below will offer your children hours of play and learning! Materials needed: 1 Scavenger Hunt file (linked above) for each child and assorted colors of Wikki Stix. Print the Scavenger hunt file for the children. Take the children on a nature walk (or a walk at the campground) to see if they can locate any of the items listed on the printable. When the children return home, set out assorted colors of Wikki Stix and ask the children to create some of the items they found on the walk. It is fun to observe all the creations the children can make with Wikki Stix! Materials to make the stick puppets: Brown, yellow, red, blue, and orange Wikki Stix and 5 wood/craft sticks per child. 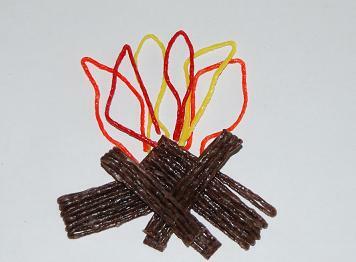 Have the children use the brown Wikki Stix to make pretend campfire logs. The brown, yellow, red, blue, and orange Wikki Stix can be used to make the flames. 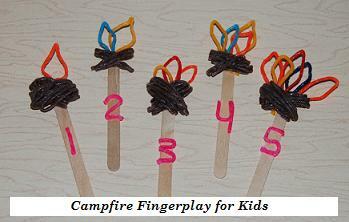 In all, each child should make 5 Wikki Stix campfire stick puppets with the corresponding number of flames (see photo above). Print the 5 Little Flames Chant above and practice the chant with the children. The children can hold up the corresponding numbered Wikki Stix puppets as the numbers are introduced in the chant. It will take the children several practices to learn the chant, but once they do, they will ask for the activity over and over again! Materials needed: Brown, Red, Orange, Blue, and Yellow Wikki Stix and any color of construction paper. 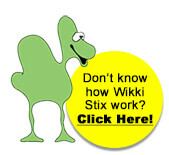 Set the assorted colors of Wikki Stix out on a table or tray to invite the children to craft and play. If desired, pre-make one campfire craft for the children to help inspire their own creativity. The campfire crafts make great summertime displays at home, at camp, in childcare, or in the classroom! The following practical life activity will help children gain important skills and allow them to follow simple 5 step directions. 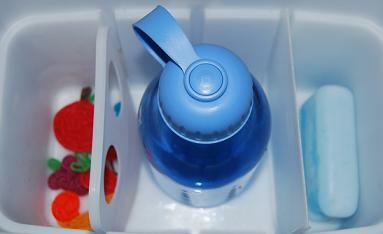 Materials needed for the activity: one pdf copy of How to Pack a Cooler (file linked above), a zippered cooler (to practice zipping and unzipping), an ice pack or ice, assorted Wikki Stix (for creating various foods), and a water bottle. Prior to doing the activity, brainstorm foods the children might like to take on a camping trip. Set out assorted Wikki Stix for the children to make any foods desired. Print the pdf file for the directions. Go over the 5 steps with the children several times. 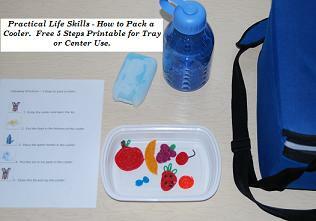 Post the five steps for the children to use as a visual when packing the cooler. Set all the necessary items out on a table or the floor. Let the children practice packing and unpacking the cooler. A campout (real or pretend) wouldn’t be complete without singing some camp songs. Here is a small list of traditional camp songs that children enjoy. 10 Camping Books that Young Children Enjoy! With Wikki Stix, children can have summer camping fun indoors or outside!